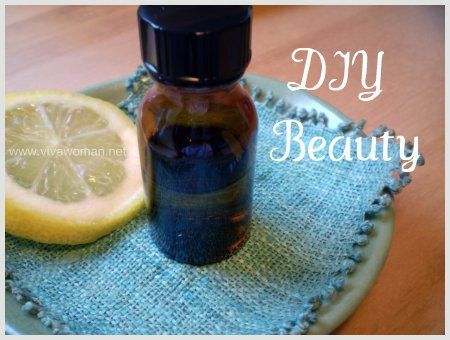 I’m so excited about this DIY homemade vitamin C serum! I was thinking of getting the L-Ascorbic Acid for awhile but was worried that I wouldn’t be able to concoct a proper serum. After reading the formulation on a few beauty forums, especially from Alyssa aka Complex Beauty at Glowing Diva, I developed more confidence and ordered my first kit from Whoopeekiddies. And it turned out so easy! Now I’m kicking myself for not trying it out earlier. Vitamin C has worked well for me in my skincare regime and as I’ve covered in my earlier entry on the different types of vitamin C for skincare, L-Ascorbic Acid is known to be the only natural form of Vitamin C in skin care products. It is a potent antioxidant proven to stimulate the synthesis of collagen, strengthens the capillaries and cell walls, as well as protect both beta-carotene and Vitamin E from oxidation. But while it easily absorbed by the skin and can stay for up to 72 hours, L-ascorbic acid can be irritating to those with sensitive skin. In addition, it is highly unstable and oxidize rapidly. The DIY L-Ascorbic Vitamin C Kit I obtained contains just two items. The 2g L-Ascorbic Acid in powder form and 10ml vegetable glycerin. According to the website, this recipe makes a serum with approximately a 10% concentration of vitamin C and you should split them into 2 portions, 1 for each week, to maintain freshness since L-Ascorbic Acid is unstable, prone to oxidation. However, I didn’t follow these instructions. Instead, I used about a 1/4 teaspoon of the L-Ascorbic Acid Powder, let it dissolve completely in 5ml of mineral water and then added about 8 small drops of the vegetable glycerin. I dislike adding too much of the glycerin because it makes my combination skin too oily. And at this formulation, the watery serum stings my skin slightly for under a minute and it isn’t sticky. The amount of vitamin C is probably too diluted but I want my skin to get used to it before I gradually increase the amount. This portion is good for three days in the fridge. By applying twice a day with a cotton wool or sometimes just my fingers, I can use all the 5ml within that time frame. Remember, vitamin C oxidizes quickly so my recommendation is to use it quickly. Five days is about the maximum. In addition, I also use an amber glass bottle to store the serum as vitamin C degrades quickly with light. Hence, do not store using clear glass. The DIY kit from Whoopeekiddies is good for about two weeks and cost S$3.50. Very affordable! I can effectively replace my John Masters Vitamin C Serum with this now. Plus I plan to order both the L-Ascorbic Acid powder and the vegetable glycerin separately now that I’ve gotten a hang of making this properly. In addition, I’ll probably increase the amount of L-Ascorbic Acid once my skin is used to the stinging in order to benefit from the higher concentration of vitamin C. According to information from the website, at a 10% concentration and low ph, ascorbic acid has been shown to stimulate collagen, decrease wrinkle depth and have lightening effects on pigmentation. But one very important thing is, always apply your sunscreen when using vitamin C because it is a sun sensitive ingredient. Don’t ever go tanning with it! Update: It’s good to add a drop of vitamin E to the formulation. 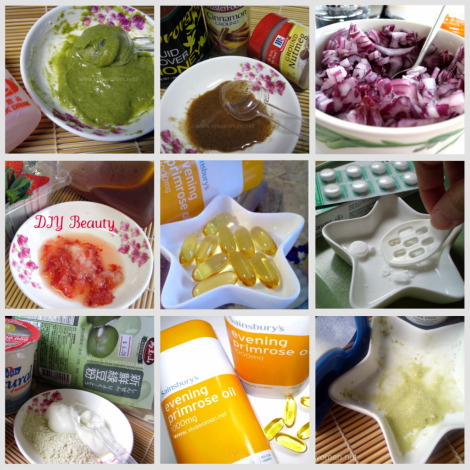 Previous Post: « Evening Primrose Oil for PMS and beauty? Anyway, quick question: What is your recipe’s Vitamin C % concentration? I have sensitive skin so like you, I want to start out slow. TIA! 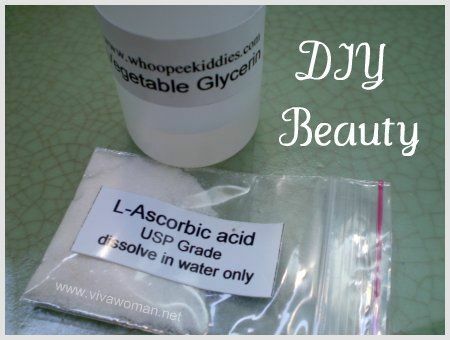 I use 1/4 teaspoon of the L-Ascorbic Acid Powder, let it dissolve completely in 5ml of mineral water and then added about 8 small drops of the vegetable glycerin. But later on, I stopped using the glycerin altogether. 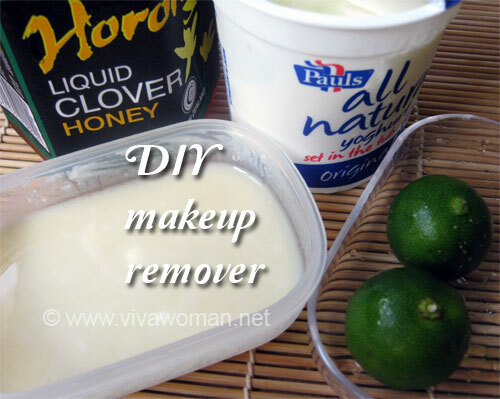 Anyway, I no longer use this DIY serum cos my products have vitamin C – and yes, I only use it in the night now. By the way I just want to share with you this useful site for concocting your own Vitamin C Serum. You said the glycerin made your combination skin too oily – that’s true. You can try replacing glycerin with Propylene Glycol, which is a humectant that seals in moisture, and aids in better Vitamin C penetration into the skin. I already bought my own glycerin, but I think I’ll try buying Propylene Glycol as it looks to be rather cheap. Just spree it in! I just found your blog. Thanks for the recommendation. I got freckles on my face. I wonder whether vit-c works on me or not? and i have checked out Whoopeekiddies that you have mentioned. Is it changed to http://www.milagrotrading.com/store/??? Are they the same?? Is it ok to order from them as well? Yes, they are the same. Freckles are more of an inherent issue so not too sure if vit C works well enough but no harm trying if your skin is not sensitive. Maybe you should have a look at this. BE careful with ascorbic acid, since it is not vitamin C.
On the original manufacturer’s website, the product is labelled as L-Ascorbic Acid. This is the right type of powder you are looking for. Pity the website doesnt ship to Singapore. Hello! I recently started making and using vitamin c serum. However, it seems that whiteheads pop up and today two acnes show up as well. There are so many people who rave about this so I don’t want to give up yet. Any suggestion what I can do to avoid the acnes and whiteheads while still getting the benefits of vitamin c? Any advice is much appreciated. Have you exfoliated your skin? I’ve read some pple just can’t use it. So you try if exfoliation will help to reduce the whiteheads. If not, probably this isn’t suitable for you. Thank you for your response. A bit disappointed that this may not work for me. 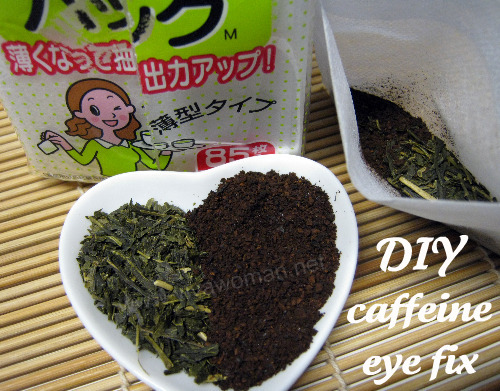 1 teaspoon in 1 teaspoon of warm water and mixed thoroughly but the granules didn’t completely melt. What am I doing wrong? I think you put too much and hence it’s not dissolving well. Is there a difference between the vitamin c you are usin and buffered ascorbic acid? Also does it make a difference between vegetable glycerin and normal glycerin? Believe the buffered ascorbic acid has got added minerals? So not sure how that works out for the skin. Normal glycerin should work too. I have been using this vitamin c serum but I am thinking of switching from using glycerin to using propylene glycol because my skin becomes so oily when I use this serum. I think the glycerin works best for those with dry skin or in the winter for those with oily/combination skin. Perhaps…try changing and see what happens. I want to make a vit. C serum but unfortunately in my country theres no ascorbic acid in powder form, at least not cosmetic or food grade. I work at a lab and theres vitamin c powder (L-ascorbic acid) but the label specifically says not for household use. Do you think using tablets could work?. The ones I have are 500 mg ascorbic acid (it doesnt specify if its L-ascorbic acid). 1 pill provides 833% of daily value. Other ingredients: Microcrystalline cellulose, stearic acid, silicon dioxide, croscamellose sodium, magnesium stearate, pharmaceutical glace. Sodium free, sugar free, starch free. I haven’t tried to know for sure but I did read some ladies using it with some success. However, it may not be as effective. I went everywhere but just can’t find the vit c anywhere in spore…..
Hi Sesame! I am thinking about making this for myself. Are you still using it and how are the results? Any change in terms of lightening of dark spots (my main concern) and wrinkle reduction (need antiaging)? Did you up the AA in the end as well? Thanks! It was okay, but a tad troublesome plus I had to guard for oxidization. My skin condition was quite constant then…not much of lightening but probably some evening out of skin tone. Do you have updated links on where to buy the Vitamin-C kit, or recommendations? I’d love to start making my own. Try skinactives.com based in US. so i can use mineral h20 ? i read from forums that to use distilled h20. how about boiled h20? Mineral is okay and so is distilled. Boiled is not as ideal if it’s not filtered. plz suggest how vit c works on facial skin and time it takes to remove sun spots and blemishes. You can substitute glycerine with Jojoba Oil. Will not clog the pores. Hi I have bought L ascorbic acid online . I try to mix half a table spoon of this powder with cold water but it doesnot dissolve . Does that mean this is not a genuine product I bought ?? Hi , I bought l ascorbic acid online and try to mix it wit cold water but it doesnot dissolve . Does that mean this product I bought is not genuine or is it harmful for my skin ?? Instead of using cold water use room temp or slightly warm. Don’t get it too warm as you don’t want to harm the vitamin C.